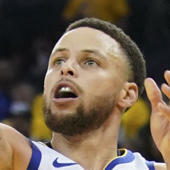 The NBA season is over, and for the second straight year, it ended in the same way: With the Golden State Warriors defeating the Cleveland Cavaliers in the NBA Finals. This time they did it in a sweep, earning that feat with a 108-85 victory in Game 4. With the game well out of hand, and the season heading to an anti-climatic end, Cavs coach Tyronn Lue had a chance to give LeBron James a proper send off. "The King" exited the game with just over four minutes to play, receiving a standing ovation from the Cleveland faithful, and congratulations from the Warriors' stars. It would be a dramatic moment in any season, but especially in this one, as LeBron's future in Cleveland is very much in doubt. Set to be a free agent this summer, this could have been the final time that LeBron walked off the floor as a Cavalier. It's going to be a very, very interesting summer in The Land.